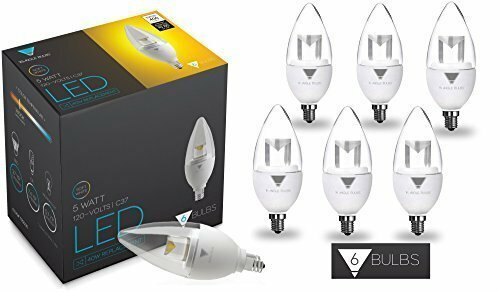 Home › Energy-Efficient LED Lighting › Triangle Bulbs T95035-6 5W E12 Led Candelabra Equivalent To 40W Incandescent ..
Triangle Bulbs T95035-6 5W E12 Led Candelabra Equivalent To 40W Incandescent .. Designed as a direct replacement for E12 base candelabra bulbs. E12 Base, Chandelier Base, Warm white 2800K, Life 30,000 Hours. 40 Watt equivalent, yet only consuming 5 Watts. Not Dimmable, No hazardous material like mercury or UV. Super bright, energy efficient, long lasting, and saves money. Reliable, high quality LED light bulbs by Triangle Bulbs. Incorporates a new shaped lens that allows the optics to radiate brilliant,clean and sparkling white LED light. The improved light quality providesconsistent color from every angle. Fits most standard nightlight fixtures.It's 400 Lumens provides warmth and will allow for a wide variety of otherapplications. Can be used for both distance and close-range directional light.What makes this LED bulb special is that you buy these at an unbelievably lowprice while it achieves brightness with up to 90% less energy costs than thebulbs they replace, and they last up to 30,000 hours.